The Delhi Capitals were in a great mood after their 39-run victory against the Sunrisers Hyderabad on Sunday and after the match, the players took to the ground floor. The Delhi Capitals were jubilant following their 39-run victory against Sunrisers Hyderabad at the Rajiv Gandhi International Stadium in Hyderabad on Sunday. Under dramatic conditions, it was the young pacer Kagiso Rabada who displayed a clinical effort as he bagged four wickets. 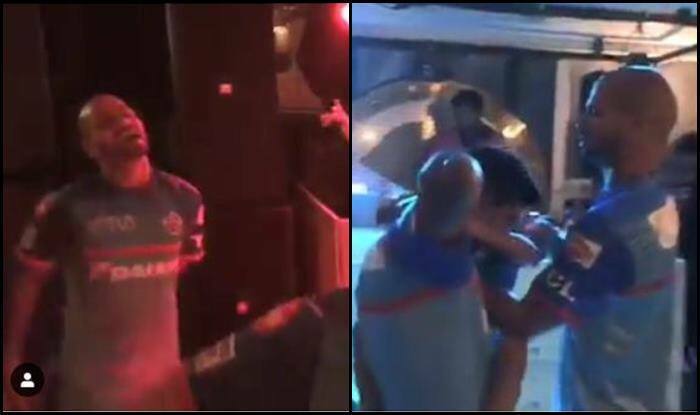 After the match, the Delhi team was in great mood and seen celebrating on the dance floor. Donning their jerseys, the likes of Shikhar Dhawan, Rishabh Pant and Ishant Sharma were grooving to some indie-music. While Pant’s celebration was cut short as he took charge of babysitting Dhawan’s kid Zoravar once again, leaving the opener free with his wife to enjoy the moment. The couple stole the show with their moves while Ishant was also trying to shake a leg and catch up.